Staff and patients were evacuated from an oncology ward at a Swansea hospital after a fire broke out on Sunday. 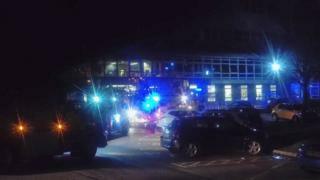 Fire crews were called to ward 12 of Singleton Hospital at 21:40 GMT. No-one was injured, but some of the 36 patients who may have inhaled smoke are being monitored as a precaution. Abertawe Bro Morgannwg University Health Board said it is working hard to keep disruption to a minimum, but advised there may be some knock-on effects. Shona Hammond Smith was in a ward in the hospital when the alarms started ringing. "We got out of our beds to leave but we were told to stay in our rooms," the 20-year-old said. "We could see blue lights flashing outside and two fire engines pulled up and then another two raced down. I could see four fire engines and a lot of firefighters rushing around." She added: "At the time we didn't know how big the fire was, so it was really scary. "They evacuated another ward and brought some of the patients into our ward. We never officially found out how it started. It went on for an hour and a half. "The nurses did a really good job of keeping us calm, reassuring us and making sure we felt safe." Chris White, the health board's chief operation officer, said some planned procedures were being postponed as a result of the fire. He added: "There may be some knock-on effects to our services as a result of temporarily losing these beds. "Morriston and the Princess of Wales hospitals are extremely busy, and because of the situation at Singleton there is less flexibility for intra-hospital support. "The damage to ward 12 will be assessed later, but it is likely that the ward will be out of use for some time." The health board is asking people who do not have a serious illness or injury to seek alternative methods of treatment. Mid and West Wales Fire and Rescue Service said the fire was confined to a room on the sixth floor of the building. The incident is being investigated by the fire service.